LankaWeb – COAL STORY ,WHAT A MESS ………. COAL STORY ,WHAT A MESS ………. 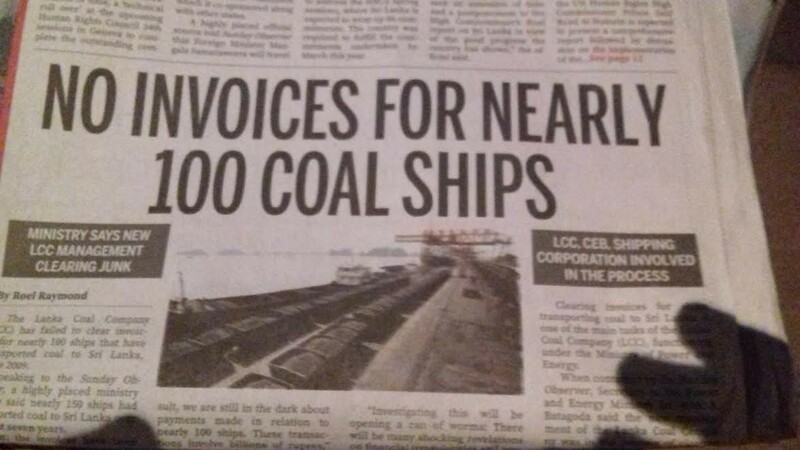 We read many news items about Coal .CEB ,Ceylon Shipping Corporation (CSE) ,Lanka Coal Company are have contributed to this mess . When Norrocholai was built by Chinese ,CEB never obtained any proper advise from Marine Engineers to decide how to unload coal from bulk carries on to the conveyor belts on the pier .They misjudged the depth of the sea near the purpose built pier.When Chinese offered to supply two tugs and a non-self propelled barges to CEB to transport coal from a bulk carrier anchored in deep sea ,CEB should have checked whether the barges and tugs can be effectively handled near the pier .Barge being pulled by the tugs could not be kept stationery in deep sea due to the fact that they are non propelled and when the un loaded coal was brought to the pier it was difficult to keep stationery at the pier . Both new rugs tugs and three 5000 tugs were sent to Trinco and now rusting .Tenders were called to sell and the offers were quite low.We offered to make the barges self propelled and buy the tugs .CEB just ignored our offer .They now rusting and soon they will be scrapped . What a waste ? and CEB does not want to admit that they messed up. With connivance of some VVIP ‘s in the previous regime the contract for transporting coal from bulk carriers to the Norrocholai pier was awarded to an Indian Company with heavy kick backs .CSE is handling the contract. Lanka Coal Company was formed to get more and more kickbacks and stooges were appointed by the ministers to earn money . Now they have changed the Board of Directors and what Yahaplana advocates were doing during the last two years . We also heard about the irregular handing of coal tenders .Ministers are keeping mum ? How can this country go forward like this ?? ALL THESE BUGGERS ARE DAMNING BLOODY ROGUES. THERE ARE 225 RATS IN PARLIAMENT, GNAWING AT TILLS, BANKS, TRYING TO GET AS MUCH MONEY TO FEAST ON. THIS HITAN, HUTAN, AND CYCLOPS KA-TAN, WILL LEAVE THE BONE DRY, AND NOTHING WILL BE LEFT FOR THE PEOPLE. THERE HAS TO BE A TSUNAMI TO DROWN ALL THE BLOODY ROGUES IN ONE STROKE. BE THEY BE CURSED. WE ARE TALKING, TALKING, AND TALKING, AND THAT IS ALL WE CAN DO. WE ARE POINTING OUT THIS AND THAT. WE ARE ALL POURING WATER ON THE THREE DUCKS BACK. UNG PEENA PEENA SAPEY INNAWA. BHG (Battaramulla Hora Guhawa) is maintained by “VIYATH HORU”, engineers of CEB, who are equally responsible for this. They are the highest paid bunch of thieves.